I would like to introduce you to the setting for Witchwood; hopefully you will find it an interesting world to explore. Across the continents major powers scramble for resources and influence, while other cultures hold tightly to what they have or do their best to remain unnoticed. 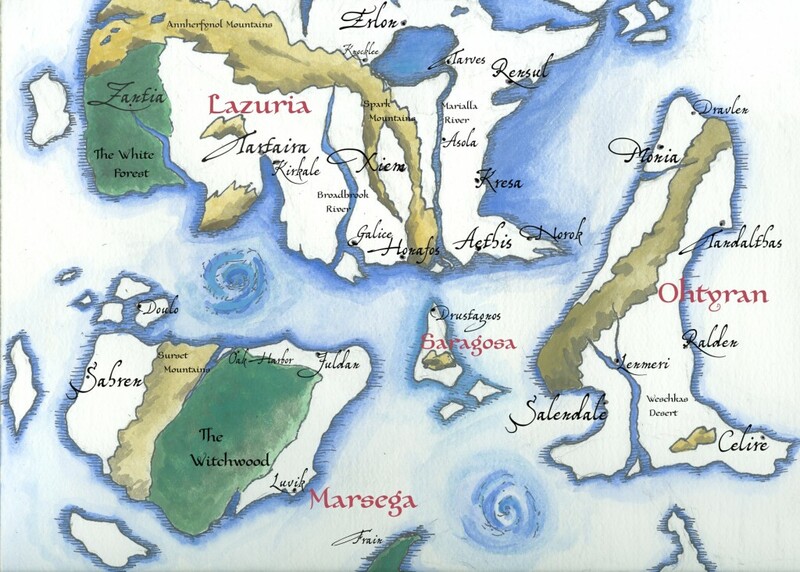 Elves, Humans, Lyra, Dwarves and Galatura co-mingle in these communities, scattered across the continents, having lived together for time immemorial. Our map offers a birds’ eye view of Evren. Here there are the soaring cliffs of Kresa, where people of the Fandalee listen to the whispers of prophecy born upon the wind. The woods surrounding the town of Frain have an icy beauty in an otherwise bleak frozen landscape. The clan of Kalmaks who live there are known for their furs and hospitality. There is the bustling island of Saragoda, where people who have wandered from all corners of Evren mingle, trade and hire out on the ships that sail the seas. The city of Tortaira is more reserved, a center of commerce and study, built upon the ruins of the city that stood before it. The clanholds of the Lothlan ring out with festivals and sounds of combat, while the villages of the Agni Lana are eerily silent, nearly indistinguishable from the forests where they dwell. In our rulebook you will find more information about the cultures and the magics of this world. There are a few points worth calling out, however. Unlike many fantasy settings Evren is not predominantly a feudal society. In most of the world governance is based on commerce, cultural and family bonds. Additionally, the fantasy races mix freely throughout the world, and each contain individuals as diverse as humans in our world. Not all Dwarves are miners and not all Elves love the wood. Instead these fantasy races indicate ties to the realms of the universe. Nor are they strictly linear; although children usually inherit their tie from one of there parents, sometimes they are of a different race entirely. Hopefully you will find Evren both familiar and intriguing.